VANCOUVER, B.C. 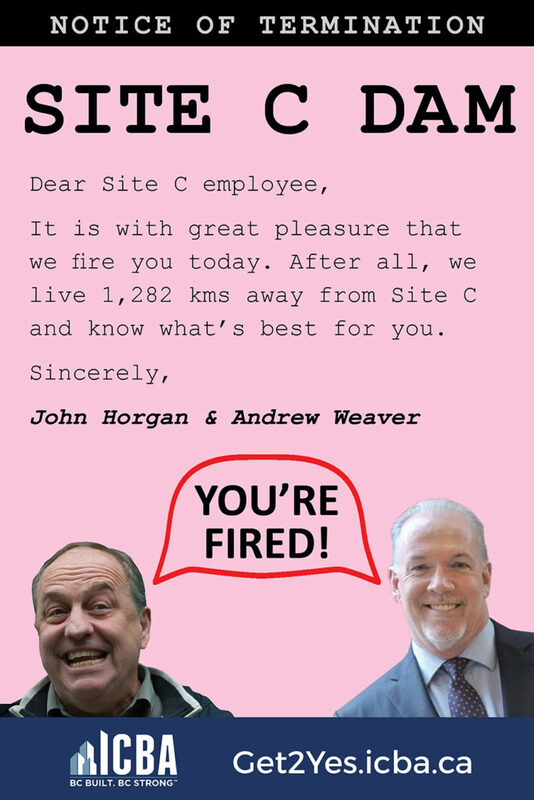 : With 2,252 jobs hanging in the balance, the Independent Contractors and Businesses Association (ICBA) launched a public campaign today to push the NDP-Green alliance to #Get2Yes on the Site C dam. 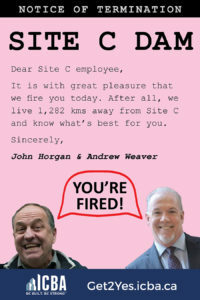 ICBA launched its campaign with a media event at BC Hydro’s Vancouver headquarters, using 2,252 Site C pink slips to illustrate how many people went to work this morning on the Peace River dam site. It is encouraging members of the public who support clean energy jobs to visit Get2Yes.icba.ca and send an email to B.C.’s three party leaders. Site C spent more than a decade going through environmental assessments and regulatory reviews, and was signed off by both the federal and provincial governments – all of which was upheld by a unanimous decision of the B.C. Court of Appeal last fall. In the coming weeks, ICBA will hold more #Get2Yes on Site C campaign events in Victoria and Fort St. John.